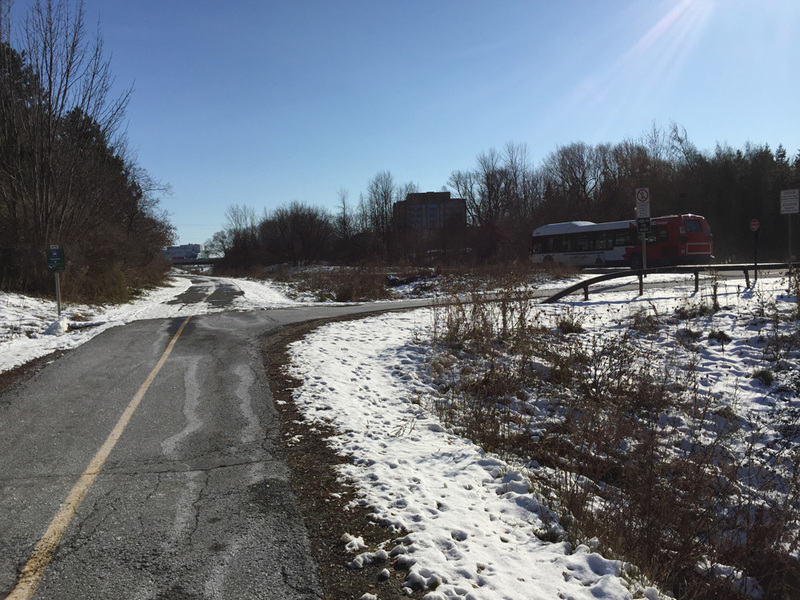 The national capital region has a fine network of recreational pathways used by many cyclists throughout the spring, summer and fall to get to work, however only a small portion of the paths are maintained throughout the winter. This results in many cyclists having to abandon their regular ride in to work throughout the snowy months, or attempt to find a safe alternative route. 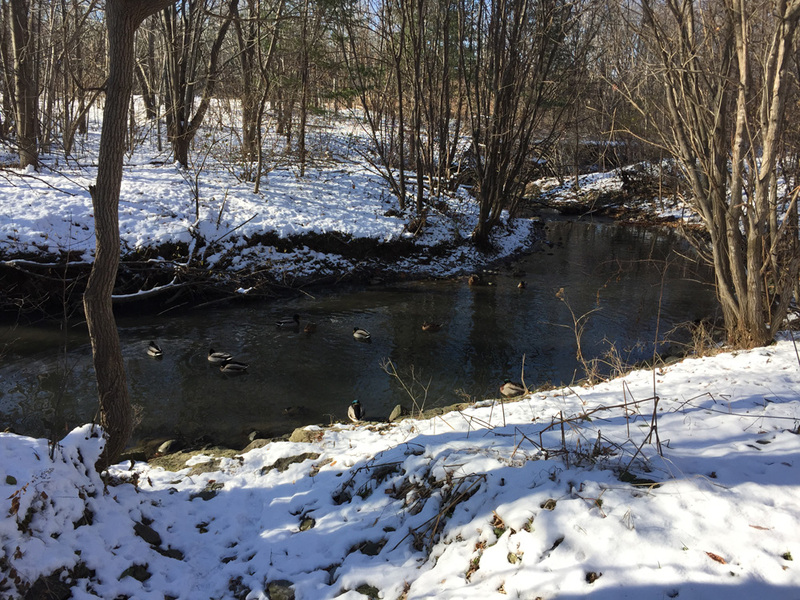 BK was enquiring about a route from Lincoln Fields in the west end of town to Colonnade Road further south, since sections of the Pinecrest Creek Pathway aren’t cleared of snow. Here’s what I discovered. 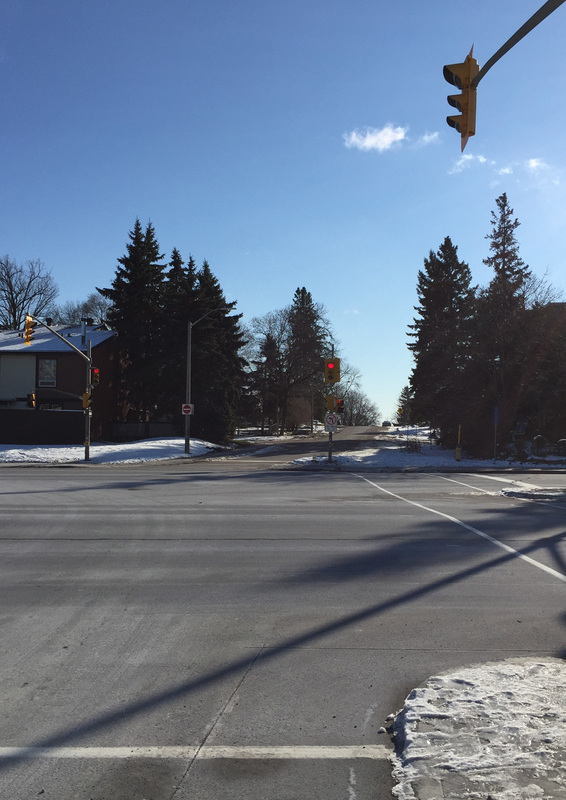 Our journey begins at the intersection of Assaly Road and Richmond Road. I rode through the intersection, then around the Lincoln Fields Shopping Centre through the parking lot. 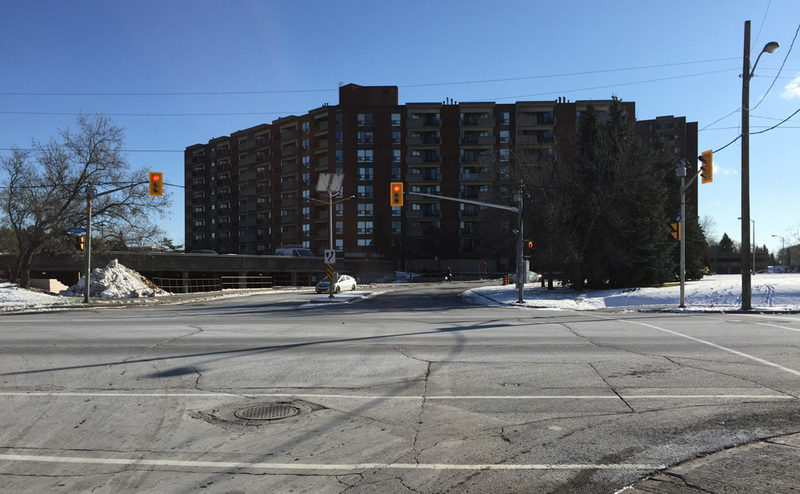 There are traffic lights on the south side of the shopping centre to get across busy Carling Avenue over to Connaught Avenue. Connaught eventually veers east just before the Queensway and becomes Roman Avenue. There’s a path that cuts between houses at the eastern corner of Roman Ave. This path was cleared but not salted for a short 40m section. Beyond that the path was both cleared and salted. 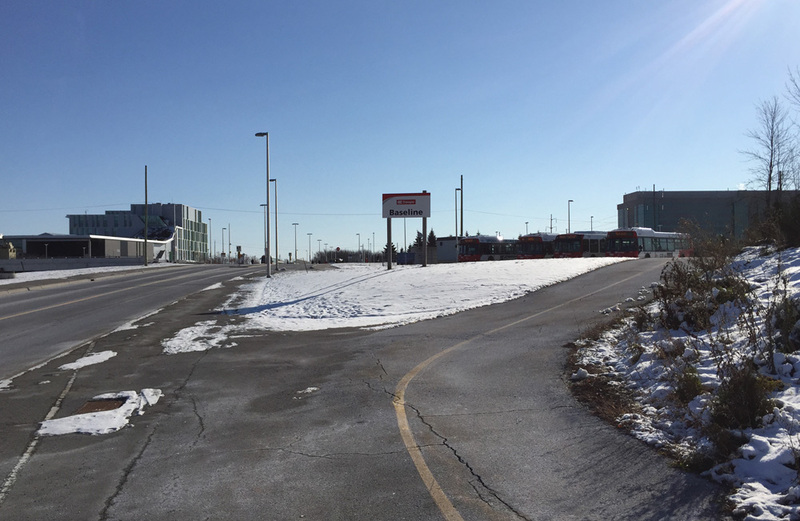 The cleared/salted section of path follows alongside the Queensway to the OC Transpo transit stop. 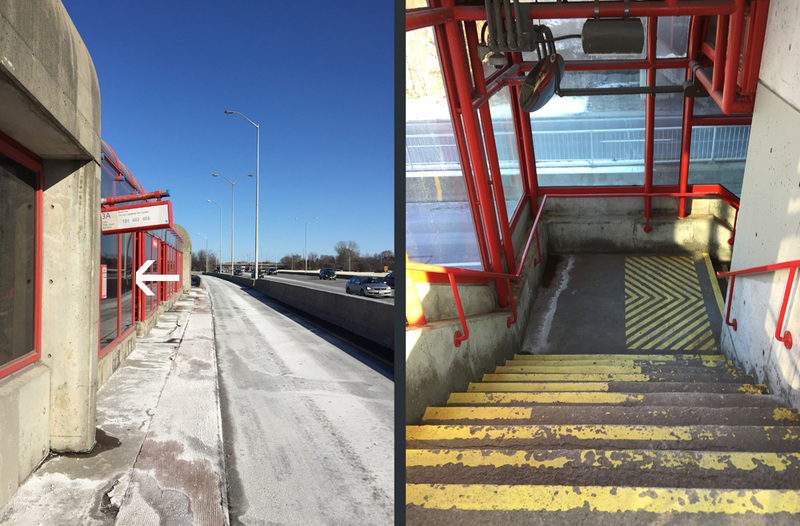 I carried my bike down the stairwell one level to the Transitway. I could have taken the elevator. This allowed me to access the Pinecrest Creek pathway, which is plowed and salted to Iris St. 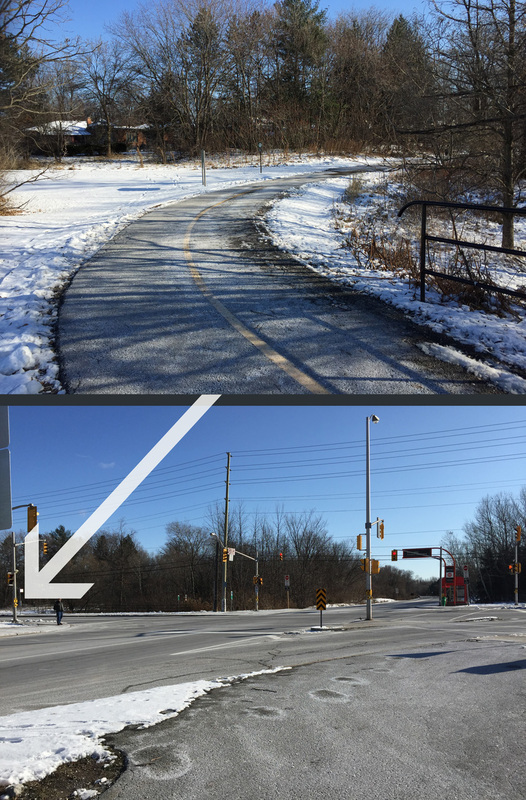 I wasn’t expecting to see the Pinecrest Pathway cleared and salted south of Iris St, but it was, and, as one cheerful cyclist riding in the opposite direction confirmed, all the way to Algonquin College! In hindsight I suppose this is done to provide students access from the transit station. That’s a guess. Regardless, it was a pleasant surprise. Things get a little wacky along the path just beyond Baseline. 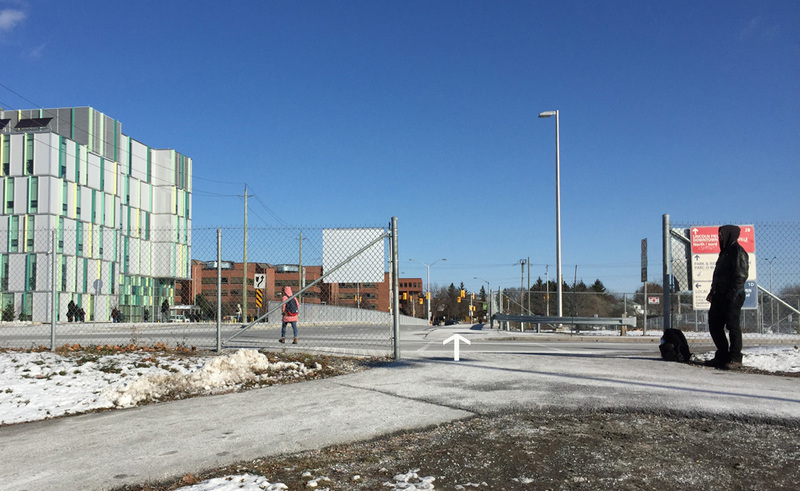 In snowless conditions, most cyclists ride along the wide sidewalk in front of the transit stop entrance (towards the left on the photo below) to access the path on the opposite side, versus following the official route (off to the right on the photo below) that veers around the transit stop. 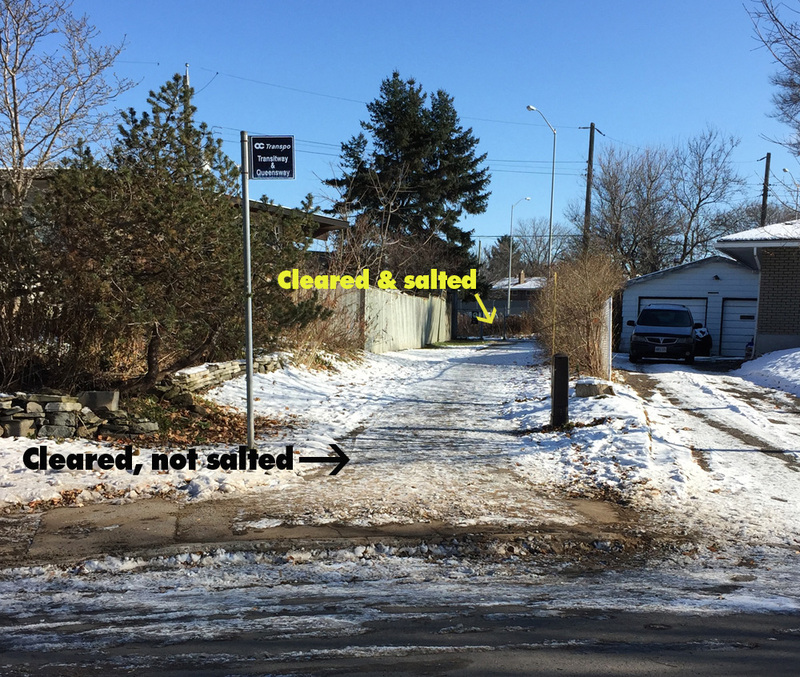 Looks like the sidewalk is plowed but not salted, so I took the official path. On the left – sidewalk in front of transit stop. On the right – path around the transit stop. To get across Woodroffe Ave I left the path and crossed at the intersection opposite College Avenue. I rode along College and turned off the path that accesses Ryan Farm Park. I was expecting the path through Ryan Farm Park to be cleared & salted as it is one of the few access points to the campus from the huge residential area just to the south where many students dwell. It was, but only to the edge of the park. There is a path that appears to be plowed/not salted along the western edge of the park, but the predominant desire line which I am confident is trampled flat within hours of a snowfall by hundreds of students, cuts right through the park. I relied on my studded front tire to get me across safely. 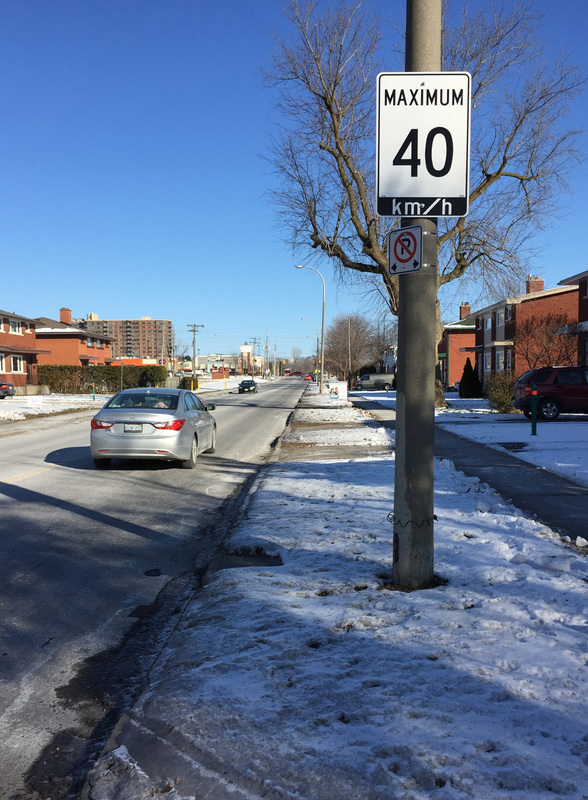 I then wove may way along quiet residential streets, eventually accessing Meadowlands Drive from Rowley Avenue. I often hear mention of Meadowlands in radio traffic reports, which is usually indicative of a pretty busy street. It was indeed, however the single lanes are quite wide. Not too encouraging for winter riding I realize, as that’s where snow gets piled. This route follows Meadowlands for just half a block, and the cleared sidewalk was safe enough to walk your bike. Or, one could ride along the sidewalk if there are no pedestrians, but I’m not suggesting anyone do that. 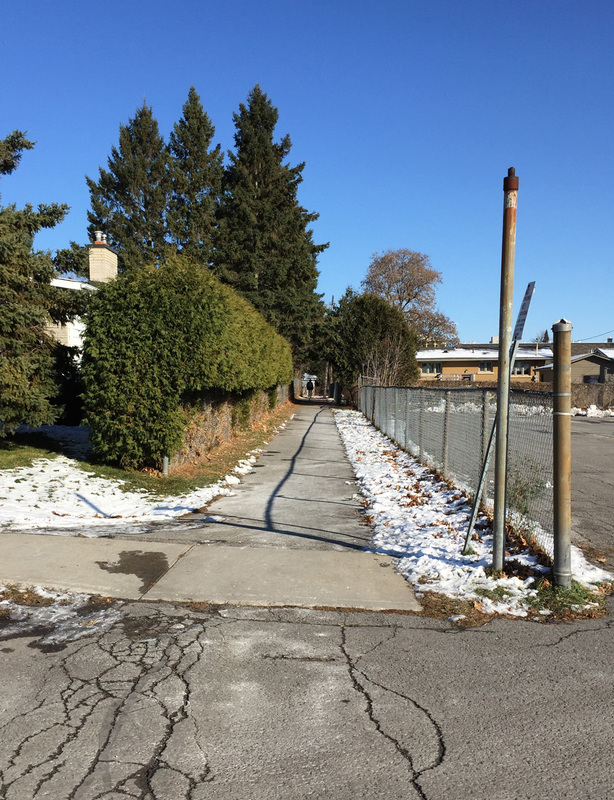 I then rode south along Perry St as far as Meadowlands Public School where there is a short cleared & salted path I took to access Glenridge Rd. I followed Glenridge to Viewmount Drive. The section of Viewmount from Glenridge to Merivale is lousy. Minimal shoulder and lots of impatient traffic. My route followed Viewmount for an extended block. I took to the sidewalk. Viewmount isn’t as bad east of Merivale. There’s a generous shoulder to ride along half a block beyond Merivale. I turned south at the intersection of Grant Carman Drive, which leads to a bike path. 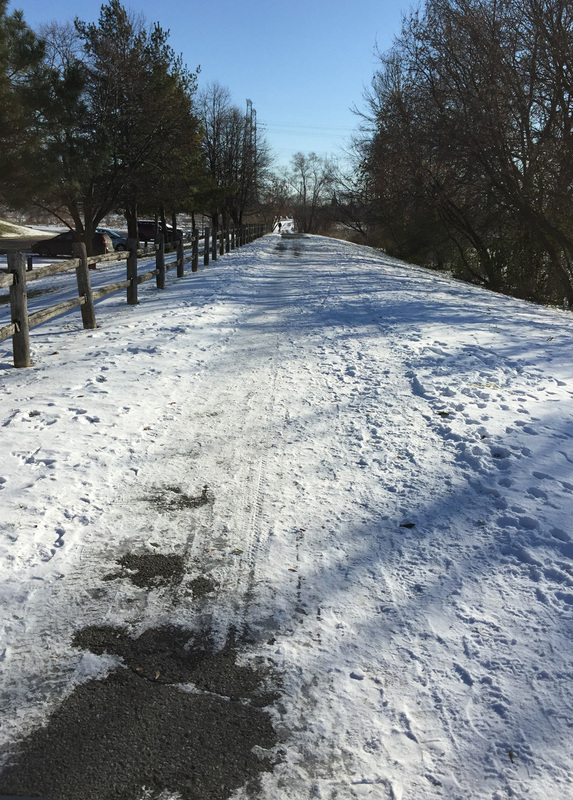 This path, which accesses Colonnade Road, was cleared, not salted. At a distance of 325m to Colonnade it’s a fair distance to push one’s bike. Once again my studded front tire kept me upright. 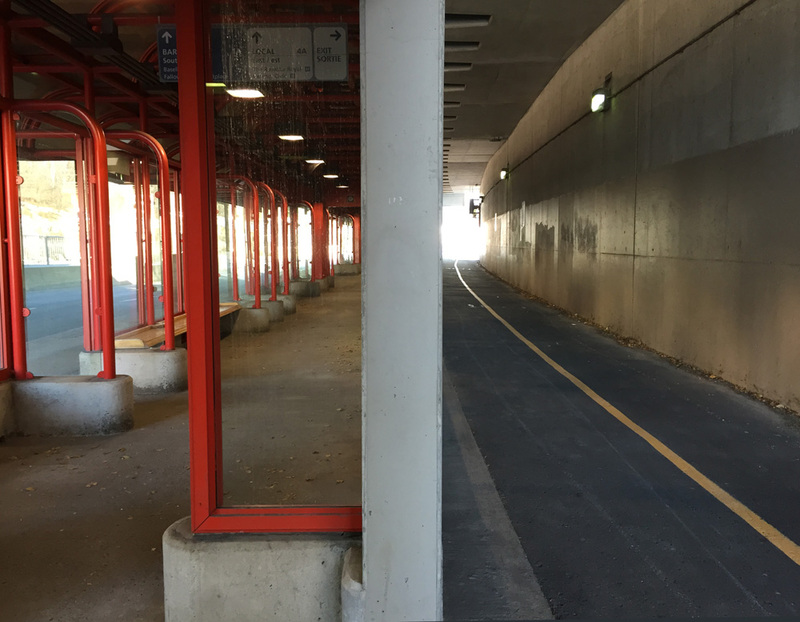 I would not recommend riding along Merivale to access Colonnade. 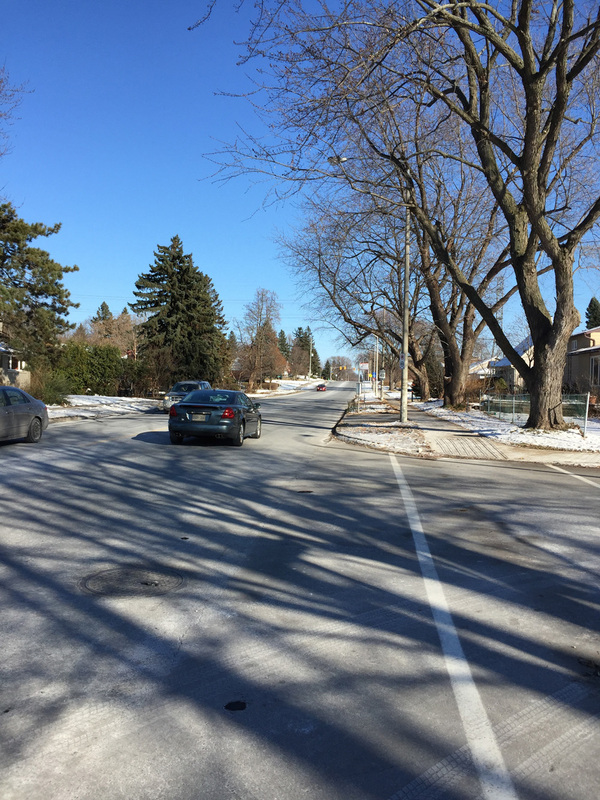 I consider it to be one of Ottawa’s most dangerous roads to bike along in any season. Riding this route has made me realize sections of recreational paths are cleared if they provide a pedestrian link, for example to the OC Tranpo stations or to schools. Also, the extent of clearing seems to depend on whose jurisdiction or property the paths are on. It’s all a bit unpredictable, but definitely worth exploring in search of a safe winter bike commute route. Previous Previous post: Riding the Churchill Avenue Bike Track! Next Next post: Crossing the new Airport Parkway Bridge !